One Saturday afternoon way back in the summer of 1980, Scottish football fans had the novelty of watching a live TV schoolboy game between Scotland and England. In those pre-satellite TV days live games on the box were a rare occurrence and this game was to be a particular treat. 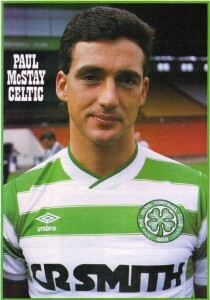 Paul McStay, at 15 years old, was Scotland’s captain and had already made the newspapers given the fact that he was following in the footsteps of his famous relations from the 1930’s, Jimmy and Willie McStay, by signing for Celtic. Still on a Celtic schoolboy form, Paul was outstanding, scoring twice in a thrilling 5-4 victory, aided by fellow Celts’ signings Ronnie Coyle and John Sludden. 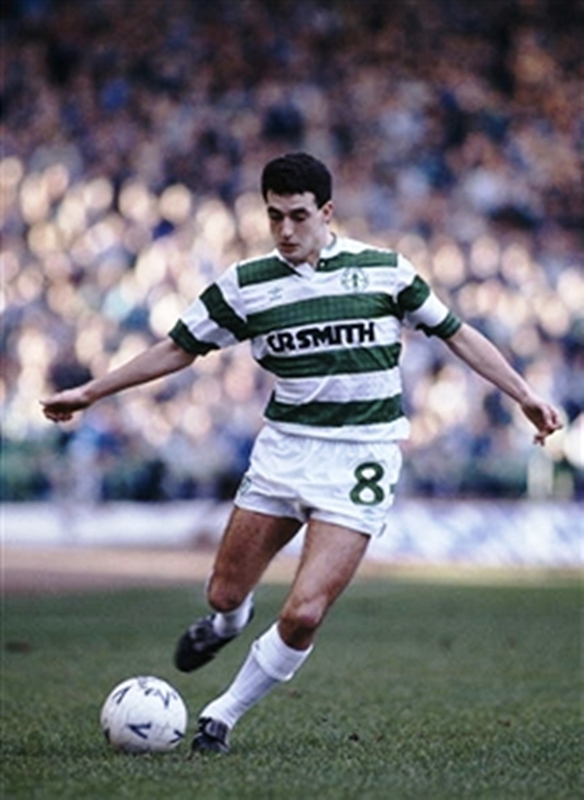 Paul McStay had now come to prominence and on that Summer’s day we hoped that he would continue his progress into the Celts first team. Fast forward to December 1981 and Scotland under 18’s faced West Germany in a European qualifier at Ibrox. Paul was captain of an exceptional team which included Brian McClair, Dave McPherson, Eric Black, Neale Cooper, Brian Rice, Gary Mackay, Pat Nevin and Dave Beaumont who all went on to have fine careers in the game. The game was very technical and from memory it finished 0-0 with the young Scots winning away and they ultimately won the competition the next summer by beating Czechloslovakia in Sweden in the final by 3-1. To date this is the only international football tournament a Scots team has ever won and Paul lifted the trophy. However there is another reason for me recalling this game. My form teacher at school gave my friend and I free tickets as we lived in the Govan area at that time. My Father warned me to be careful before I set off for Ibrox when he discovered I was seated in the main stand. I thought he was over reacting but there was a half time penalty kick competition between Charlie Nicholas and a Celtic S form boy, Davie Cooper and a Rangers S form, and Billy Stark, then of St.Mirren and a St.Mirren S form lad also. Each player took five penalties against the then Scotland goalkeeper Alan Rough and the winners would receive a new set of strips for their school football team. The players all wore Scotland tracksuits on a bitterly cold night and obviously Nicholas received a bit of cat calling from the Ibrox crowd. However after Charlie and the Celtic boy scored all ten penalties (!!!) to easily win the competition, Charlie unzipped his tracksuit to show the hoops underneath whilst collecting the prize. All hell then broke loose in the Ibrox main stand, with a tirade of vile sectarian abuse spewing forth that I have seldom heard matched until this day, which was quite disconcerting for two 15 year old Tims sitting amongst it all. So my Father was right to have concerns after all, and the Celtic S form boy who rattled in five penalties ? A certain Peter Grant. I digress slightly because this is Paul’s story. By 1982 manager Billy McNeill could hold his prodigy back no further and the young McStay made his debut on 23rd January 1982 at Parkhead against Queen Of The South in the Scottish Cup. There are two things I can recall about that day. Firstly, the Rangers end of the ground was closed off due to a burst pipe that had caused flooding and then iced over in the freezing temperatures and secondly, a young player called John Halpin also made his debut and made a bigger impression than Paul by scoring the fourth goal in a 4-0 win. Seven days later Celtic travelled to Pittodrie to face Aberdeen and you must appreciate that the two Pittodrie fixtures in those days were the toughest of the season with the Dons under the influence of Alex Ferguson. 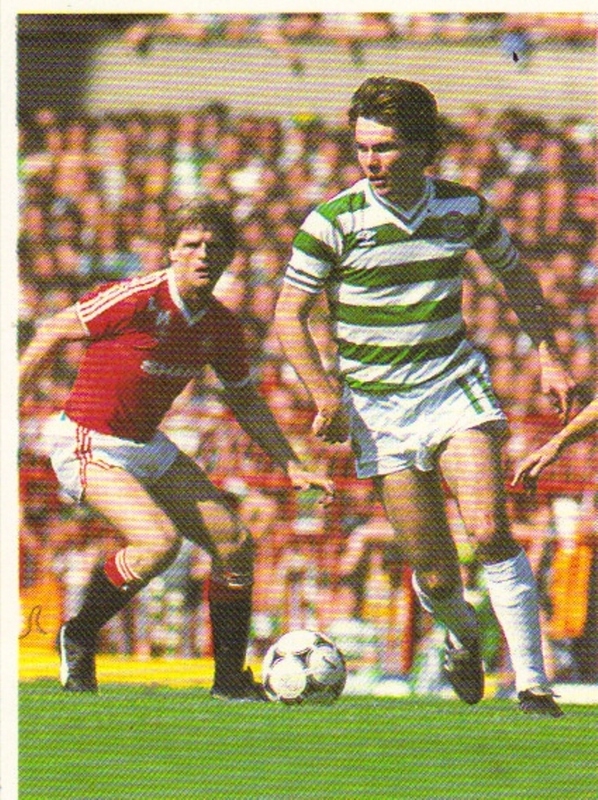 With Celtic leading 2-1 late in the game, Paul took a lay off from George McCluskey and ran through the Dons defence to lash a left foot shot past Jim Leighton, much to the joy of the large Celtic support massed behind that goal. 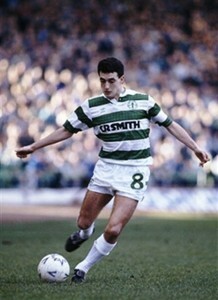 Paul McStay had definitely arrived. By the start of the 1982/83 season he was a fixture in the first team and remained so for the next 15 years. 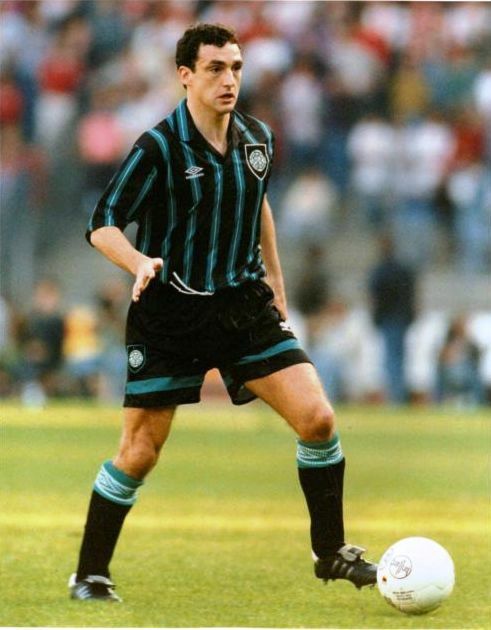 In 1983 he was now an established Scotland international and was courted by Inter Milan who were keen to prize him from Celtic for a £2M transfer fee. Scotsport at that time filmed a short piece from the McStay family home in Larkhall as brother Willie was now also in the Celtic first team and this made for a great story. Paul’s Mother was naturally proud of her sons and stated on camera that she hoped they would never leave Celtic and Paul for the rest of his career was not to let his Mother down. His career continued to progress for club and country but by 1987 he was at the crossroads of his Celtic career. Celtic were failing to keep pace with a rejuvenated Rangers and his old mentor, Billy McNeill, returned to replace David Hay as manager. 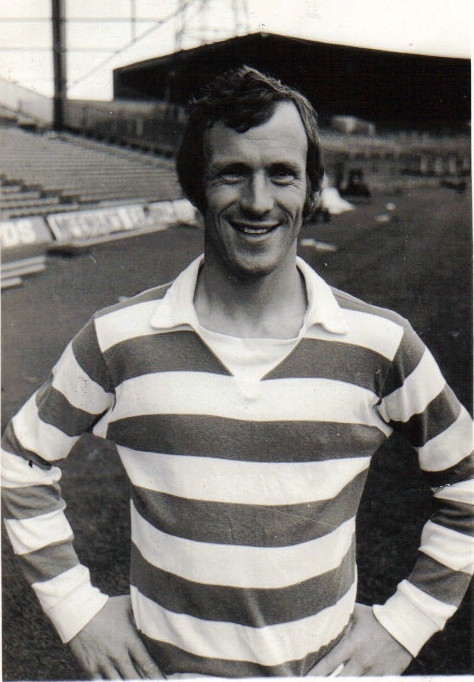 This was Celtic’s centenary season and everyone was keen to make it especially successful, but as the season wore on the media became aware that Paul’s contract was up for renewal in January. He had started the season especially well and the team was being built round his talents. One cold December night, the late night papers announced that he had signed on for the next five years, much to the relief of every Celtic fan and it was said that there was no agent involved, just Paul and his Father John negotiating the terms. There was much rejoicing at the news. That centenary season will always be recalled when considering Paul’s time at Celtic. He was simply sensational and everyone will have their own personal memories of that time. In December 1987 Celtic were at Brockville, always a difficult place for any Celtic side. Well into the second half, with Celtic struggling, Paul strode forward and cracked home a spectacular 30 yarder past future Celt Gordon Marshall, to keep Celtic on course for the title. In January 1988 he scored perhaps his best ever goal in the hoops against Hibs at Parkhead. He sent Joe Miller racing down the wing with a glorious pass and when wee Joe cut the ball back across the area Paul had continued to move upfield to finish the move by sending a glorious shot high past Andy Goram. In the 1988 Scottish Cup semi final he was sensational again, starting a plethora of Celtic attacks on the Hearts goal from which, ultimately, two late goals took us into the final. But perhaps the most popular memory of that season is the wonderful pirouette and pass on the Parkhead half way line against Rangers in the New Year victory which resulted in Frank McAvennie’s first goal. Graeme Spiers stated that you could hear the ripping of the Rangers defence as Paul’s pass dissected the Ibrox back four. Celtic won 2-0 and the League was bound for Parkhead. Without him it would not have been possible. The period of 1990-1995 was one of the most troubled in Celtic’s history. An inept board, a ramshackle stadium and a lack of investment in the team all added up to be very difficult medicine to take, especially as Rangers were vastly superior in every department at that time. Looking back, only the performances of Paul (and John Collins) made life bearable for the long suffering fans. Paul kept up a high level of performance even accounting for the mediocrity around him especially in games against Rangers when Celtic would be well up against it. In these games it was not unusual to see Rangers send out the likes of Ferguson (Ian), McCall, Spackman and Hurlock, ‘hammer throwers’ whose sole purpose was to destroy and stop Paul from playing in any way possible, fair or foul. 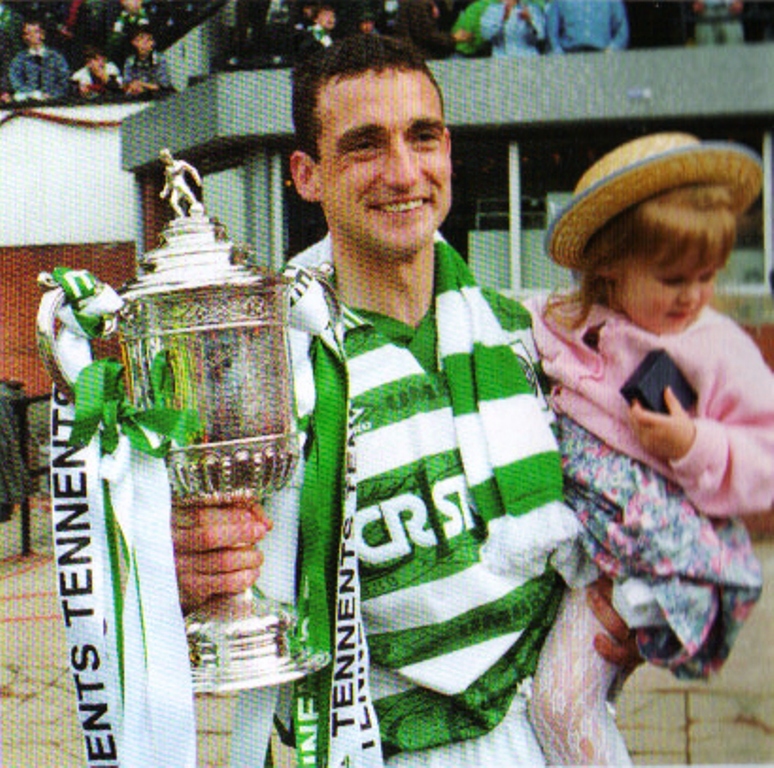 With Roy Aitken’s departure in January 1990 there was only one candidate to take over the captain’s role and although there were some who felt that Paul’s personality was not cut out to be captain material, he set a fine example through the years and the fans would have it no other way. In 1992 there was again rumours of his departure at the end of his contract and the papers gleefully informed us that Rangers would love to have him, perish the thought, but this was mischief making at its worst. Celtic were in a slump and few of us would have blamed him for moving on and in May at the end of the last league match against Hibs, he ran to the Jungle and threw his jersey into the crowd in a gesture which suggested that he would be looking for a new club. However, after weighing up his options, he again resigned and would end his career in the green and white and we were most glad for this change of heart. The arrival of Fergus McCann and Tommy Burns at different levels saw Celtic raise their game and they faced Raith Rovers in the 1994 Coca Cola cup final which represented considerable progress, as no silverware had arrived at Parkhead for the previous five years. We can all recall the game going to penalties and Paul missing THAT kick. He was inconsolable, as we all were, and there was a difficult away game at Easter Road only three days later. As always the spirit of the Celtic fans was unbreakable and a group of them unfurled a banner that night which read – ‘Paul – You’ll Never Walk Alone’ in praise of our midfield hero and Tommy Burns even went into the crowd before the game to thank the fans for their backing. There is a happy ending, for six months later Celtic won the Scottish Cup against Airdrie with an emotional Paul receiving the cup from a smiling Duchess of Kent after Pierre Van Hooijdonk’s header had won the day. The next season saw him have a memorable testimonial game against Manchester United on a very foggy night when United turned out in grey and were barely distinguishable in the fog in a CelticPark still undergoing modernisation. On that night the fans were able to show Paul their appreciation for his wonderful service to Celtic through the years. When analysing Paul’s career it’s only fair to recall some of his best games and goals and although not a great goalscorer he was a scorer of great goals. 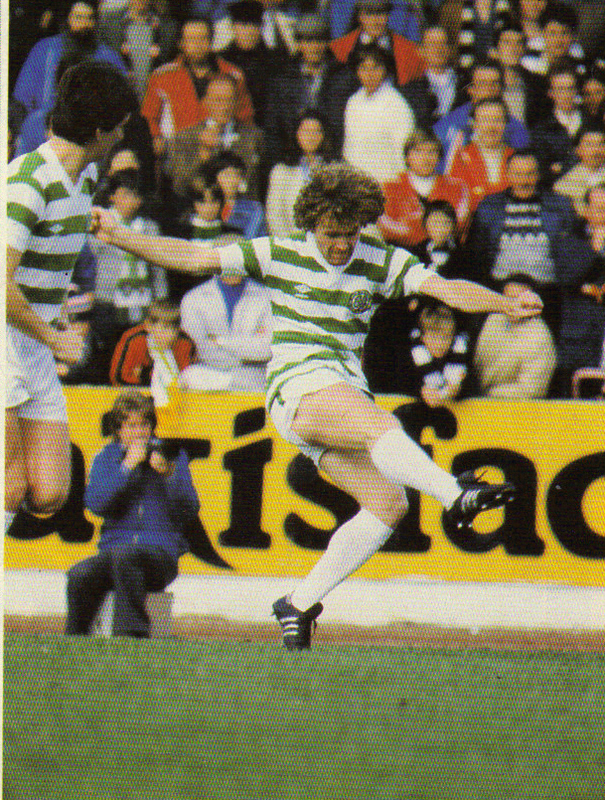 In April 1984 both he and brother Willie scored in a memorable 3-0 thrashing of Rangers at home. In February 1985 he single handedly destroyed a strong Aberdeen side with a masterful display in a 2-0 win at Parkhead, scoring a wonderful penalty which he simply stroked past Jim Leighton with total calmness. In 1992 he scored a cracker of a volley against Cologne in the UEFA cup and he led the Celtic fightback from 2-0 down to win 3-2. In August 1994 he scored a wonderful goal in a 2-0 win at Ibrox and late in the game gave a wonderful cameo when he nutmegged the new Rangers £4M (really !) man Duncan Ferguson, left him floundering on the ground and smacked a shot off the post. What a goal that would have been. My own favourite is a goal he scored against Dundee at Dens in 1989. Running on to a through ball 40 yards out, he delicately flicked the ball over Dundee defender Rab Shannon, ran round him and controlled the ball beautifully on his chest and ran forward to lash a left footer (his weaker foot) past the Dundee keeper at the Celtic end of the ground. It was a moment of pure genius only a great player could have scored. In his time at Celtic Paul was the player who most appealed to the purists amongst the support and lovers of football in general. He had wonderful touch, superb passing ability and vision, and a cracker of a shot in either foot when he cared to use it. He was also no slouch in the tackle and simply glided over the pitch. If there was one weakness it was that he lacked a burst of speed over a short distance but that was nothing in comparison to his many talents. In his 15 years in the first team he had a fine temperament and set a fine example on the park being ordered off only once, in August 1994 at Dens Park when a nonentity called Dusan Vrto proceeded to display a talent for ‘simulation’ that Eduardo would have been proud off. The irate Celtic fans that night would have torn Vrto apart given the chance such was the injustice and this was to be the only blight on Paul’s Celtic record. On April 5th 1997 Paul sadly limped from the field with injury at StarksPark against Raith Rovers. We were not to know it but that injury would curtail his career and this would be his last game for Celtic, although perhaps it was fitting that he finished his career with his one and only club he loved so much and represented with such great distinction. 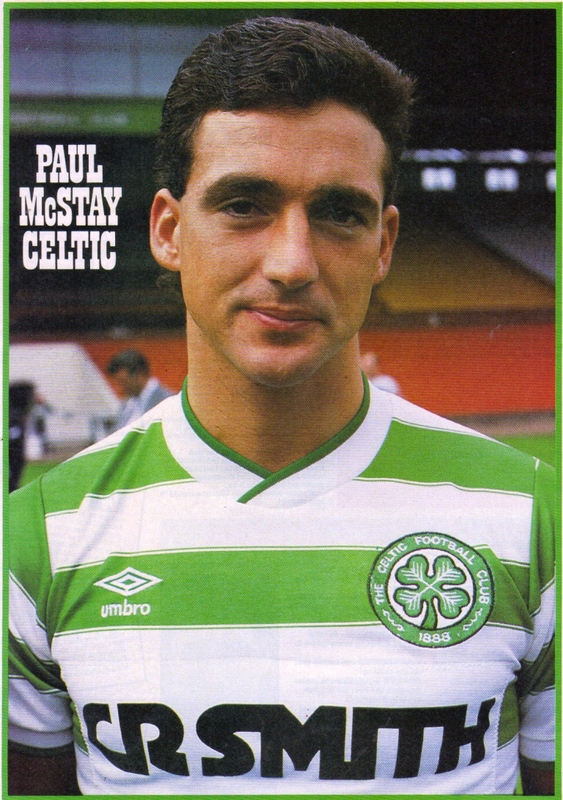 Paul McStay was a player who defined a generation for Celtic fans during the bad days of the 1990’s and for that he will always have a place in our hearts. During that difficult time he was a constant beacon of light in a period of what seemed like total darkness and he represented everything that is good about Celtic and to which we hold dear. The ‘Maestro’ was a prince of a man, a total gentleman, a wonderful footballer and will forever more be remembered as an absolute Celtic legend. PreviousDynamic Pricing Required By Celtic?